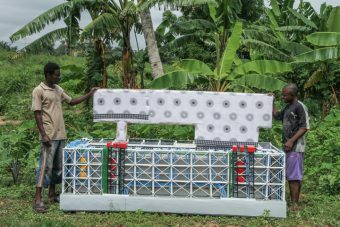 In collaboration with mainly Ghanaian artists Regula Tschumi has developed various innovative art projects and art works. Many of them were exhibited in important museums and even integrated into museum collections. 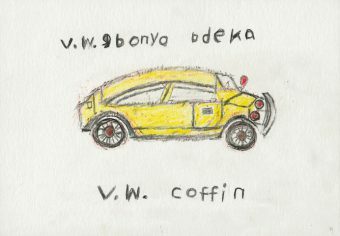 Here a selection of the resulting hand-painted film posters, figurative coffins and sculptures as well as a selection of drawings by the Ghanaian artist Ataa Oko. A list of exhibitions under Media. Biographical notes on Ataa Oko and other artists with whom R. Tschumi has worked most frequently in the last years under «Artists». 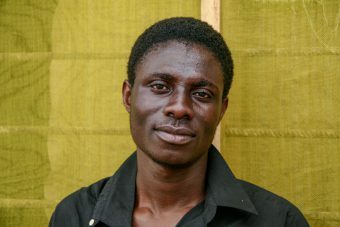 Before Paa Joe moved in 2008 from Nungua to Pombiman, coffin miniatures were only made in his studio by his apprentices. 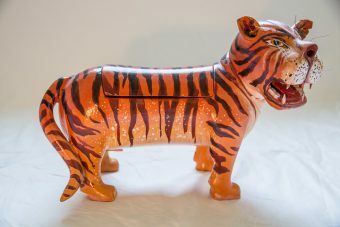 They were allowed to sell their pieces to tourists so that they got some pocket money. The artist Saâdane Afif ordered a coffin in the shape of the Centre Pompidou. 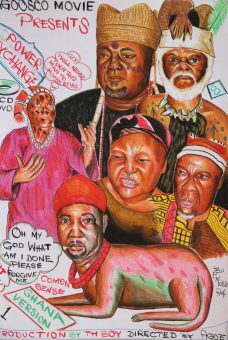 The first group of «Africa Pulps» was created in 2007 after the artist M.S. 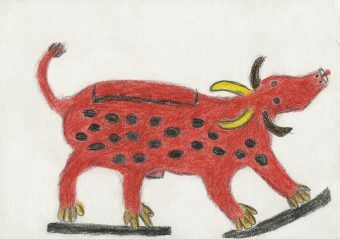 Bastian had seen some of Kudjoe Affutu’s miniature coffins in the Art Museum Berne. 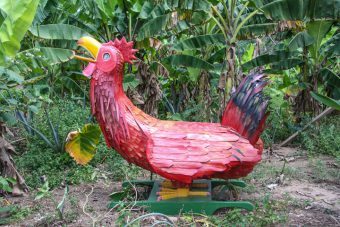 Paa Joe is a master of carving and his coffin statuettes are outstanding. In 2009 Regula Tschumi commissioned for the Biennale Off in Venice four exceptional figurative coffins. 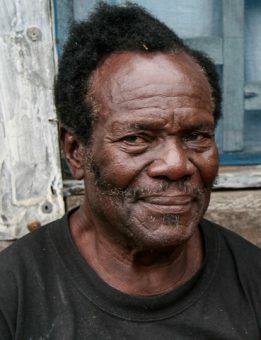 When Regula Tschumi met Ataa Oko in 2002 in Ghana, he was a 83 years old retired carpenter and figurative coffin artist. 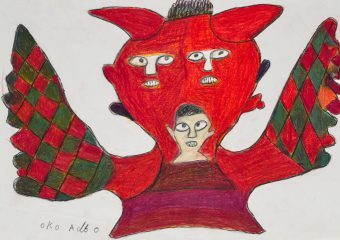 As a former coffin maker, Ataa Oko initially sketched his former figurative works from memory. 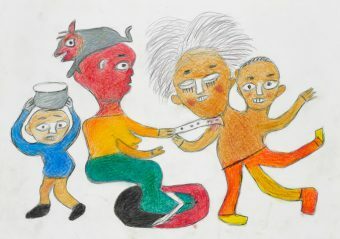 Ataa Oko now started to draw not only figurative coffins but also figurative palanquins that he had seen when he was a young man. 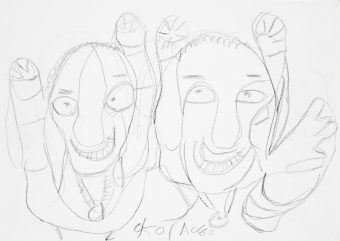 In the course of this year, Ataa Oko started to draw religious rites and human beings. 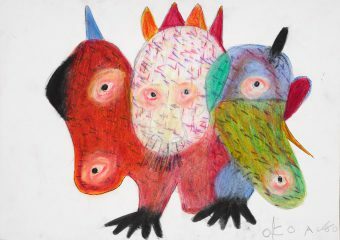 In 2008 Ataa Oko began to draw a new kind of spiritual beings, and his works now filled with strong colours. 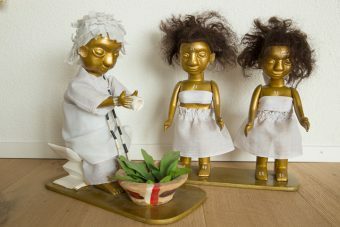 In 2009 Ataa Oko transformed his figurative palanquins and coffins into spiritual beings. 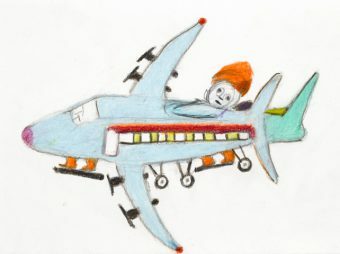 2010 was a turning point in Ataa Oko’s life, and this was also reflected in his drawings. 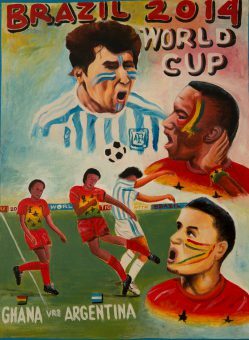 When the World Cup in Ghana took place, Ataa Oko documented the events of every day with his drawings. 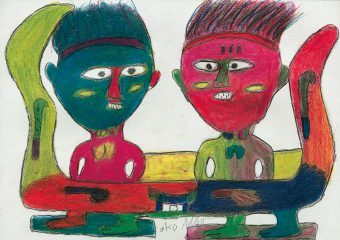 Well over 90 years old, Ataa Oko was still drawing almost every day, but the colouring was now left to his son Kofi. 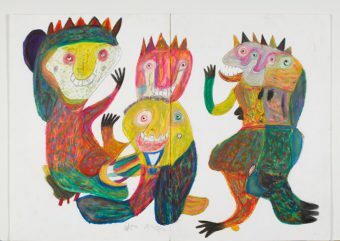 In his last years, Ataa Oko worked closely with his son Kofi, who now painted his drawings with bright colours. 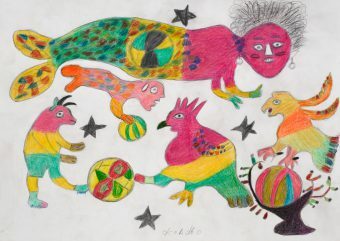 When Ataa Oko was 93 years old, he had no more strength to colour his big sketches. 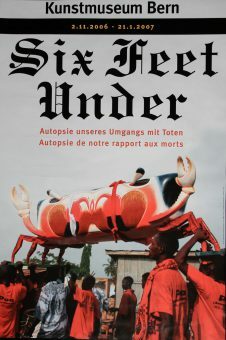 For the exhibition «Six Feet Under» in the Art Museum Berne Regula Tschumi worked with the coffin artists Paa Joe and Ataa Oko. 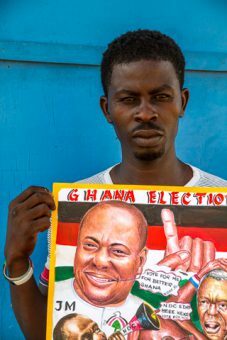 Several movie painters were documenting the Ghanaian presidential elections in 2012 and 2016. 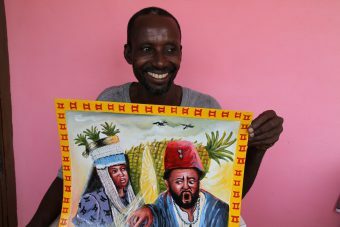 Hand-painted movie posters from Ghana are gaining increasing attention in the international art market. 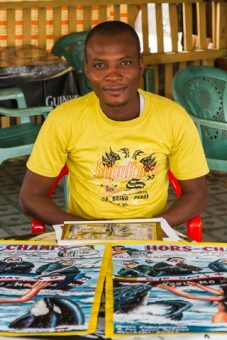 On behalf of the Musée d’ethnographie Neuchâtel, Regula Tschumi developed the exhibition poster for «Hors-Champs» with several Ghanaian movie painters. Ghanaians love football and in 2014 their soccer team played in the World Cup in Brazil. 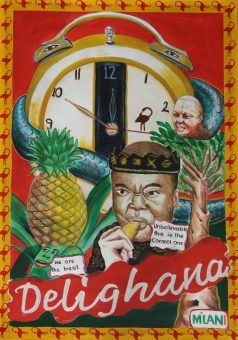 Some advertising posters on paper or on canvas for a pineapple producer in Ghana. All Ghanaian artists with whom Regula Tschumi has worked up until now were not academically trained, but they completed an apprenticeship in a workshop with a master. 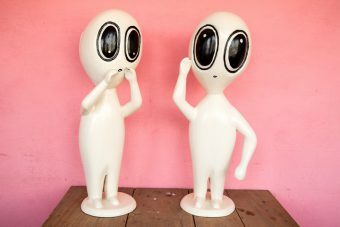 As a rule, these artists work on behalf of their customers and respond to their wishes. That is why Regula Tschumi as a client could also intervene and bring in her wishes as well as her criticism. She used to encourage Ataa Oko as well as other painters and sculptors to go new ways and experiment with the materials and colours they use. Especially in the case of the movie painters she asked them to paint from their fantasy and not to copy from already existing images as they normally do. Here some biographical notes on the artists with whom Regula Tschumi has worked most frequently in the last years. 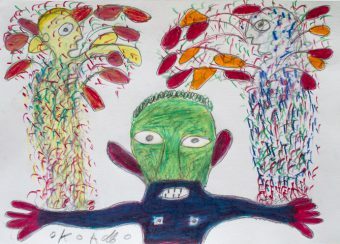 Ataa Oko (1919-2012) lived as a coffin maker, sculptor and painter in the coastal town La (Labadi) in Ghana. 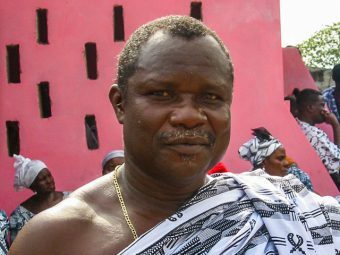 Paa Joe (* 1947) is the most famous still living coffin artist of Ghana. 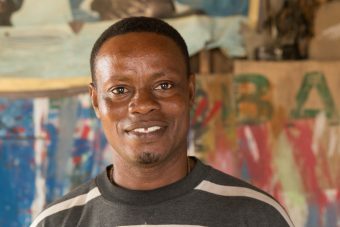 Kudjoe Affutu, a former apprentice of Paa Joe, is currently the most innovative coffin artist in Ghana. Heavy Jeaurs paints his movie posters exclusively for the international art market. Daniel Anum Jasper is a sign writer and movie painter who is well known for his excellent hand painted movie posters. 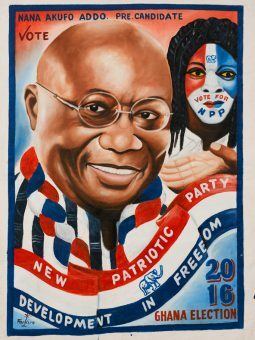 Ebenezer Mensah, with artist name Farkira, is well known for his portrait paintings of celebrities. 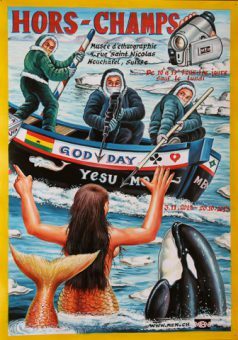 Moses Agoe (1985) is well known for his beautiful hand-painted movie posters that he sells not only in Ghana but also to art galleries and collectors outside Ghana.